The technical feasibility of removing large pheochromocytomas is well established. Laparoscopic resection has been shown to reduce hospital stay, blood loss and levels of released catecholamines when compared to open resection. Minimally invasive surgeons generally accept that laparoscopic resection for adrenal masses <5cm as the standard of care. Large pheochromocytomas (> 6cm) are rare. There are concerns about the feasibility and success of laparoscopic removal of large pheochromocytomas with diameters greater than 5cm. We present a single case study of a successful laparoscopic removal of a 10cm pheochromocytoma. A retrospective review of a single case was performed. Data was collected from medical charts. 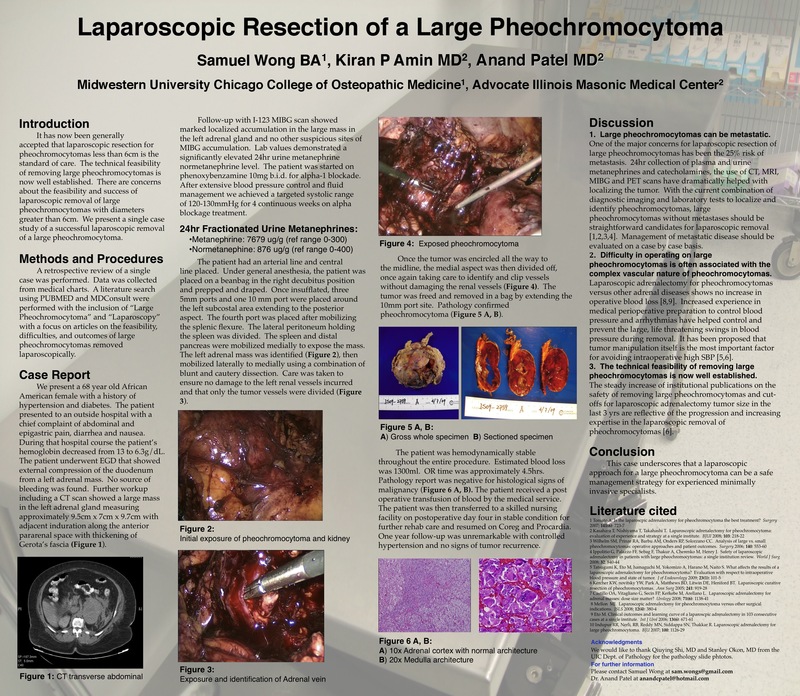 A literature search using PUBMED and MDConsult were performed with the inclusion of “Large Pheochromocytoma” and “Laparoscopy” with a focus on articles on the feasibility, difficulties, and outcomes of large pheochromocytomas removed laparoscopically. We present a 68 year old African American female with a history of hypertension and diabetes. A non-contrast CT scan of the abdomen demonstrated a large mass in the left adrenal gland. The mass measured approximately 9.5 x 7 x9.7cm. The patient was electively admitted prior to surgery for preoperative workup, blood pressure control and fluid management. The mass was successfully removed laparoscopically with the use of ultrasound. The patient remained hemodynamically stable throughout the entire procedure. Operative time was approximately 5 hours. Estimated operative blood loss was 1300cc. One unit of blood was transfused for blood loss. During postoperative day 1, patient had mild hypotension, corrected by fluids. Her hospital stay was otherwise unremarkable. Pathology confirmed a 9.4cm, 203g pheochromocytoma. She was seen in outpatient clinic and was discharged in stable condition. It has now been generally accepted that laparoscopic resection for pheochromocytoma <6cm is the standard of care. Though the technical feasibility of removing large pheochromocytomas via laparoscopy is now well established, there are many obvious concerns. Major concerns for laparoscopic resection of large pheochromocytomas include the increased risk of tumor spread and complex vascular nature of pheochromocytomas. Accepted cut-offs for tumor size in laparoscopic adrenalectomy have steadily increased from 4cm to 8cm. The increasing volume of surgical literature supporting the safe removal of large pheochromocytoma in the last 3 yrs is indicative of the progression and expertise in the laparoscopy. As the surgeon continues to gain technical experience removing small pheochromocytomas, the ability to remove larger more technically demanding pheochromocytomas follows. This case underscores that a laparoscopic approach for a large pheochromocytoma can be a safe management strategy for experienced minimally invasive specialists.